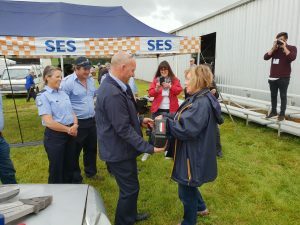 Last weekend saw the Tasmanian Craft Fair in full swing with SES members from the northern region assisting with the busy traffic and also the Meander Valley SES Unit set up at the showgrounds providing advice to visitors and live demonstrations showing off their rescue equipment. 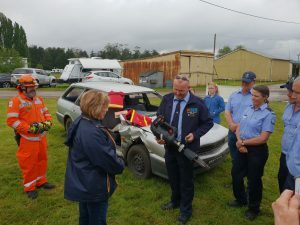 The Rotary Club of Deloraine donated a $15,000 battery operated rescue tool to the Meander Valley SES Unit. This vital piece of equipment allows our members to provide fast access for Emergency Service workers to assist patients involved in accidents. Pictured are members from the Meander Valley SES Unit and Rotarian President, Maree Matanle officially handing over the rescue tool today at the craft fair. The Meander Valley SES Unit is very thankful to the Rotary Club of Deloraine for their kind donation of this life saving equipment.